Early on, Jim made presentations for his advertising clients to promote their campaigns at sales meetings. Marketers of office machines and business communications saw another way to use Jim’s comic sensibility and characters – to create short films that would enliven product seminars, rousing participants from the stupor of technical language and diagrams. In 1963, Jim worked with both the Bell Telephone System division of AT&T and the American Photocopy Equipment Company to create entertainment for their meetings. Jim created a robot for Bell’s seminar which focused on the philosophical issues concerning man’s relationship with machines. It was open to people from IBM and similar companies, so perhaps this is where Jim first made a connection with IBM. 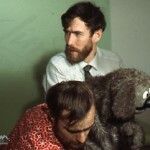 For APECO, Jim’s film featured Rowlf, and he saw how well Rowlf worked in these situations and with these types of products. 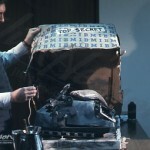 In March 1966, Jim delivered four short films to IBM marking the start of a long relationship with the company and the beginning of a professional collaboration and friendship with David Lazer, the Audio Visual Program Manager for the Office Products Division. Lazer hired Jim to make the films, dubbing them Coffee Breaks, and eventually Jim hired Lazer to produce Muppet Meeting Films. Lazer worked on numerous Henson projects over the years, serving as executive producer for The Muppet Show and Muppet feature films. Jim’s first IBM films featured Rowlf, then finishing his last season on The Jimmy Dean Show, and each started with him writing a letter to his mother about his new career as an IBM salesman. 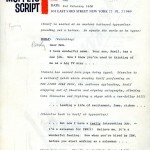 Over the course of the four films, he progressed from an ancient battered typewriter to an IBM Selectric, to the speedy MT/ST, and finished speaking into an IBM portable dictation machine while lounging on the beach in Florida, a reward for his salesmanship despite damaging equipment along the way. Rowlf’s human counterparts who made it into the “Golden Circle” level of sales also were rewarded with a trip to the Bahamas, and Jim, Jerry Juhl, and Jerry Nelson went along to entertain them. In a live appearance, Rowlf congratulated the audience, told them about his success selling Selectrics and introduced his best customer – his mom. She, in turn, offered them some remarkably astute sales advice – market the machines to women as they are the ones that do the typing – and showed them a Selectric that has been painted gold, decorated with flower decals and tassels and trimmed with fur. Rowlf promptly knocked it to the floor, ruining another piece of equipment. Jim’s expense report to his manager Bernie Brillstein (addressed to “Dear Sweet, Kind, Nice, Man-About-Town Bernie”) makes no mention of the $75 won in the casino. 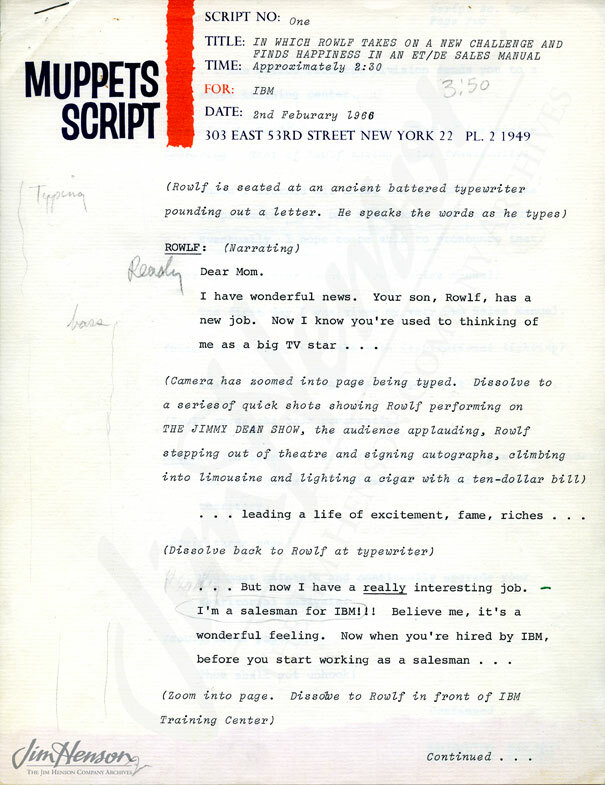 Script by Jerry Juhl for Rowlf’s first IBM meeting film, 1966. 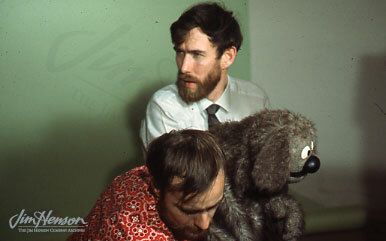 Jim, Jerry Nelson and Rowlf on the set of an IBM meeting film, c.1967. 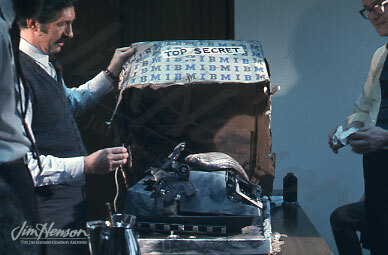 Don Sahlin and Jerry Juhl with Rowlf’s wrecked IBM Selectric typewriter, c.1967. This entry was posted in 05-May '66, 1966, Appearances, Commercials, Muppet Show, Social and tagged APECO, AT&T, David Lazer, IBM, Jerry Juhl, Jerry Nelson, Jimmy Dean Show, Nassau, Rowlf. Bookmark the permalink.